In August of 2007, more than 150 residents and notable figures of the Ebensburg, Pa. community gathered together to celebrate Ebensburg Tennis Center opening its doors. Seven years later, the tennis facility is a staple of the small, 3,000 person community. “It’s the best thing to ever happen to Ebensburg,” said Vicki Askew, the inspiration for construction of the facility. Plans for the facility were proposed when the 44-mile round-trip commute to Askew’s tennis club became worrisome for her family. Construction began with the help of Askew’s son, Vince McMahon, Chairman and CEO of World Wrestling Entertainment (WWE). McMahon donated $2.5 million through the Vince & Linda McMahon Family Foundation, Inc.
Askew, at the 2007 inauguration, posing with the plague that is hung in her honor at the tennis center. On a weekend in August, almost seven years to the day of the club’s inauguration, Ebensburg celebrated yet again. It was the first time in four years that Askew has been back to visit the facility since she moved to Montgomery, Texas. Askew loves her new home where she’s close to her family, has escaped Pennsylvania winters, and has developed new friendships. But she misses the place she called home for so long. The Ebensburg community has been redefined in recent years. Since the opening of the Ebensburg Tennis Center, the borough has become all about tennis. 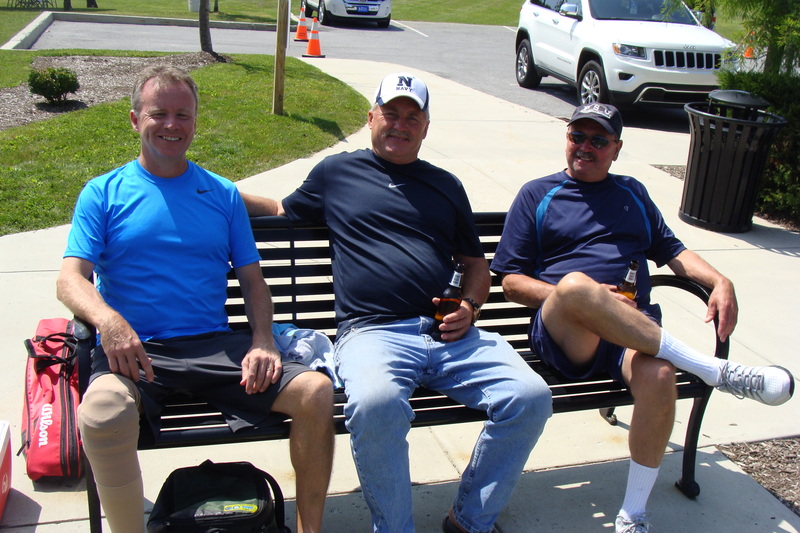 Some guests take a break from the tennis and barbeque lunch. According to Taylor, it was partly due to the dedication of the community that made the center possible. 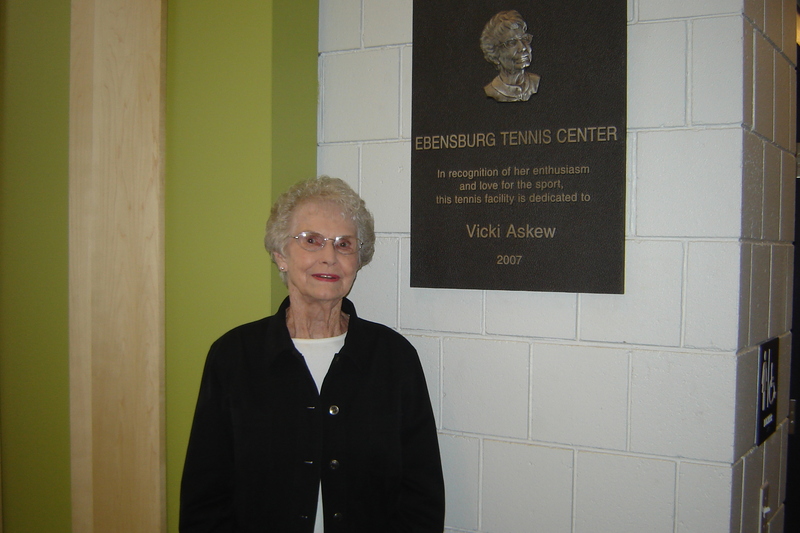 Taylor cannot talk about the Ebensburg Tennis Center without getting emotional about Askew. 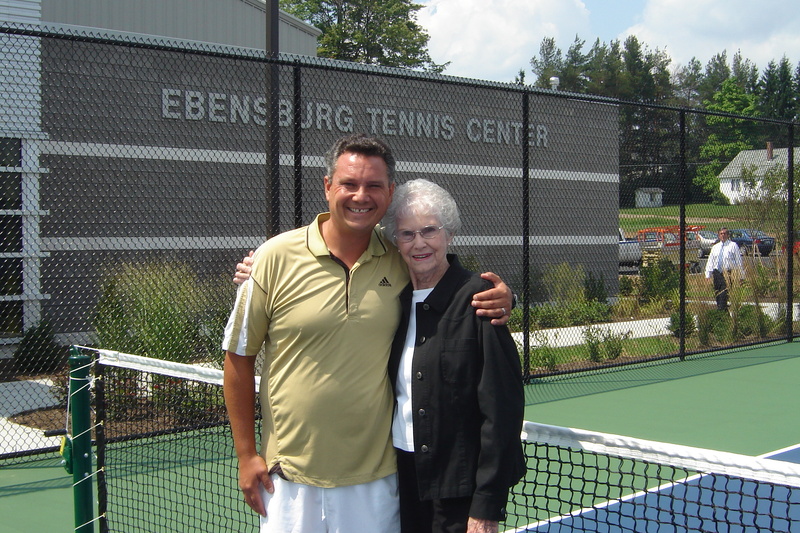 Tennis Director, Jamie Taylor, and Vicki Askew at the 2007 Ebensburg Tennis Center inauguration. Askew now lives in a gated community in Texas where she is a member of a private tennis club. At 94 years old, she still plays. To learn more about Ebensburg Tennis Center and their programs, click here.